Abstract: We propose closed-loop energy-efficient scheduling and control of an autonomous Inter Terminal Transport (ITT) system using waterborne Autonomous Guided Vessels (waterborne AGVs). A novel pick-up and delivery problem considering safe intervals between berthing time slots of different waterborne AGVs is proposed. Waterborne AGVs are controlled in a cooperative distributed way to carry out assigned schedules. 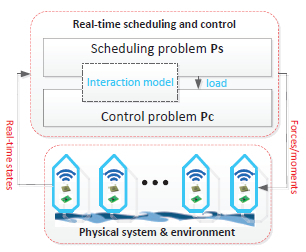 Real-time scheduling and control loop is closed by a partial scheduling model and an interaction model with feedback reflecting neglected lower level factors. Simulation results demonstrate the effectiveness of the proposed methodology and the potential of applying waterborne AGVs towards an autonomous ITT system. Reference: H. Zheng, R.R. Negenborn, G. Lodewijks. Closed-loop scheduling and control of waterborne AGVs for energy-efficient Inter Terminal Transport. Transportation Research Part E: Logistics and Transportation Review, vol. 105, pp. 261-278, September 2017.